The Food Pantry, prior to and through the holidays, was blessed to receive thousands of pounds of food and monetary donations collected by partnering groups, including (but not limited to) the Boy/Girl Scouts and associated Cub/Brownie Troops, Eagle Systems, Precise Systems, Evergreen & Greenview Knolls Elementary Schools, St. Nicholas Chapel on Pax River Youth Group, Pax River Quilters’ Guild, and numerous local citizens including Good Sam members. These donations have allowed our neighbors to enjoy a plentiful gift of food during the Thanksgiving & Christmas seasons. Many thanks to all who have contributed! Drivers (preferably with a pickup truck) are needed on Monday mornings to pick up food at the Southern Maryland Food Bank in Waldorf and transport back to “Our Daily Bread” food pantry in Lexington Park. The Food Bank opens at 8:00 am and we are usually back at the food pantry by 9:30 am. Please contact Rich S. at financialsecretary@goodsamlutheran.com if you may be available. Food supplies are short! The Southern Maryland Food Bank has been closed 3 of the past 4 weeks due to a shortage in donations, meaning “Our Daily Bread” has had to close 3 days in April and 3 in March. We have hit the “summer doldrums” 2 months early. 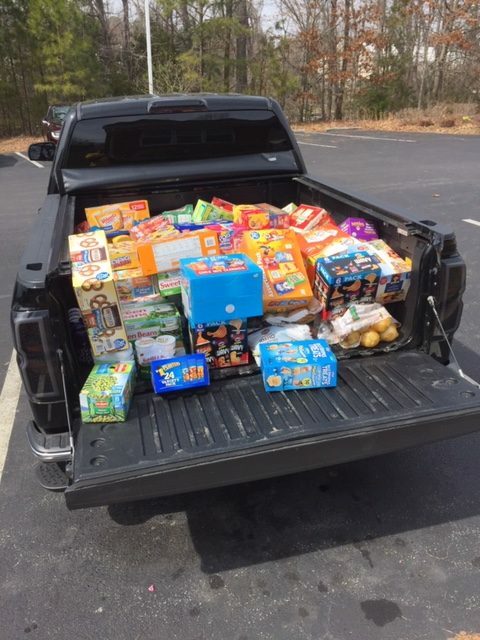 The need for nonperishable food items for our neighbors will become an even bigger issue as we get to summer and kids are out of school, meaning they will need to get two meals a day at home instead of at school. Any and all donations are deeply appreciated. Staples needed include cereals, pasta, mac & cheese, baked beans, veggies, and canned meats. We received over 200 cans of tuna during Lent, and are blessed by a local resident who has provided fresh produce to the pantry. The need is great. Thank you for sharing! Join your fellow Good Sam members and their friends in a friendly competition!! This hunt is designed to test your creativity and have fun with members of Good Sam. It is a time of fun and fellowship sponsored by the Empty Nesters. What: This scavenger hunt is a 3 hour excursion sending participants in search of things, places or people and allows them to perform activities as well. The team with the most points at the end of the hunt wins bragging rights for the whole year! When and Where: Sunday, May 18, 2014 from 10:30 am until about 2:30 pm at Good Sam. Check-in at the Fellowship Hall at 10:30 after fellowship time. Return no later than 2 pm with your hunt results. Enjoy a sweet treat while we tabulate the results and proclaim the winner. Who: Everyone. There is no age limit! Get a group together that will fit in your vehicle. We prefer you to have at least four people in your car. If you don’t have a car or don’t want to drive but want to join the fun, just let us know. Price: The admission fee is a non-perishable food item which will be given to Our Daily Bread food pantry. What else: Bring a camera, as scoring will be from the photographic evidence. Each picture and activity is worth a certain amount of points. Get creative–bonus points may be awarded for exceptional photos at the judge’s discretion. You will also need to either pack a picnic lunch or be prepared to buy lunch out with your group. When you sign up be sure to indicate whether you plan to bag or buy as you will randomly be put into teams of two vehicles. Sound interesting? Contact Jill W. for registration information. For planning purposes for this event we will need you to RSVP. Other questions please see Jill W., Diane H., Ginger L. or Nancy S.
Traditionally, some Christians prefer fish instead of other meats on Fridays during Lent, and some sacrifice or “give something up” for Lent, as part of their Lenten journey. As part of that, Our Daily Bread food pantry is seeking donations of canned or pouched tuna during the Lenten season in order to provide a nourishing fish protein option to our clientele. All donations of food or money are utilized and greatly appreciated. 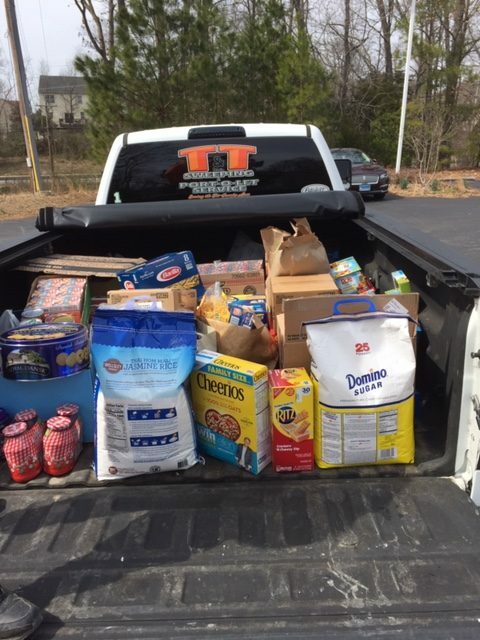 –Rich S.
Thanks to all who have donated monetarily or with food items to the food pantry. The pantry was able to provide an abundance of food to our neighbors through the holiday season. With the holidays behind us, and winter upon us, we sometimes forget the need of food assistance our neighbors might need. Food items in particular need are canned meats, soups, fruit, peanut butter and jelly. Your donations are greatly appreciated. – Rich S.